Anonymous Hackers warn Westboro Church - Stop now or else ! A group of hacktivists acting under the banner, "Anonymous," has warned a church with a controversial history that unspoken retribution will follow it continues its practice of inflammatory protests. 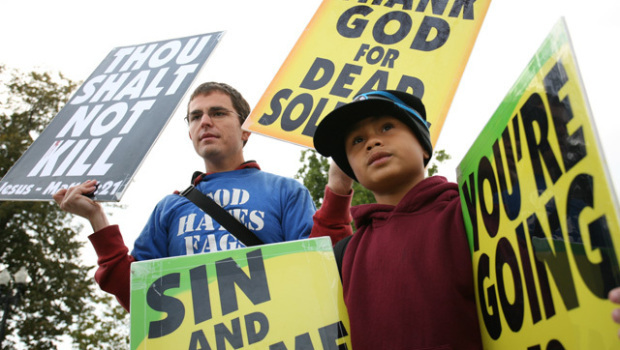 In an open letter to the Westboro Baptist Church, Anonymous has put the anti-gay, fundamentalist church on notice that "the damage incurred will be irreversible," and that "neither your institution nor your congregation will ever be able to fully recover." The Westboro Baptist Church is led by Rev. Fred Phelps. It has drawn particular attention for carrying out anti-gay protests at funerals of military servicemen with signs celebrating the deaths of the soldiers with signs like "God Hates the USA" or "Thank God for 9/11." The group operates a website with the URL godhatesfags.com. We, the collective super-consciousness known as ANONYMOUS - the Voice of Free Speech & the Advocate of the People - have long heard you issue your venomous statements of hatred, and we have witnessed your flagrant and absurd displays of inimitable bigotry and intolerant fanaticism. We have always regarded you and your ilk as an assembly of graceless sociopaths and maniacal chauvinists & religious zealots, however benign, who act out for the sake of attention & in the name of religion. Your demonstrations and your unrelenting cascade of disparaging slurs, unfounded judgments, and prejudicial innuendos, which apparently apply to every individual numbered amongst the race of Man - except for yourselves - has frequently crossed the line which separates Freedom of Speech from deliberately utilizing the same tactics and methods of intimidation and mental & emotional abuse that have been previously exploited and employed by tyrants and dictators, fascists and terrorist organizations throughout history. Anonymous recently made headlines when it got into the computer system of a security firm and posted thousands of documents describing plans to attack WikiLeaks, the Bank of America and the U.S. Chamber of Commerce.